Joel Salatin is a full-time farmer in Virginia’s Shenandoah Valley. A third generation alternative farmer, he returned to the family farm full-time in 1982 and continued refining and adding to his parents’ ideas. The family’s farm, Polyface Inc. (“The Farm of Many Faces”) has been featured in Smithsonian Magazine, National Geographic, Gourmet, and countless other radio, television and print media. Featured in the New York Times bestseller Omnivore’s Dilemma and award-winning documentary Food Inc., the farm services more than 5,000 families, 50 restaurants, 10 retail outlets, and a farmers’ market with salad bar beef, pigaerator pork, pastured poultry, and forestry products. 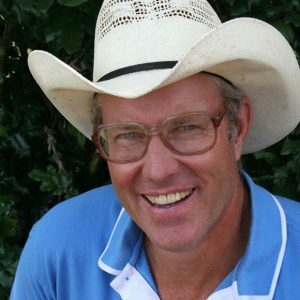 Salatin writes The Pastoralist column for Stockman Grass Farmer, granddaddy catalyst for the grass farming movement, and the Pitchfork Pulpit column for Mother Earth News, as well as numerous guest articles for ACRES USA and other publications. A frequent guest on radio programs and podcasts targeting preppers, homesteaders, and foodies, his practical, can-do solutions tied to passionate soliloquies for sustainability offer everyone food for thought and plans for action. He has authored many books, including Folks, This Ain’t Normal: A Farmer’s Advice for Happier Hens, Healthier People, and a Better World (2011), The Sheer Ecstasy of Being a Lunatic Farmer (2010), Everything I Want to Do Is Illegal: War Stories from the Local Food Front (2007), and Family Friendly Farming: A Multi-Generational Home-Based Business Testament (2001). When he’s not on the road speaking, he’s at home on the farm, keeping the callouses on his hands and dirt under his fingernails, mentoring young people, inspiring visitors, and promoting local, regenerative food and farming systems. He passionately defends small farms, local food systems, and the right to opt out of the conventional food paradigm. Contact Joel Salatin for speaking terms and dates.